2017 Blog - Race Reports etc. Click here... to read Blair's take on his first experience of Commuterlite racing. Check out Blair's bike racing profile on the OzLaverda website and while you are there follow the fascinating tale of how a bunch od dedicated Laverda fans brought the marque back to championship winning form Blair being one of the riders. Practice and qualifying combined is being trialled for 2015. The riders do two laps untimed (practice) and then are timed for the rest of the stint with the fastest times converted to their grid position for race one as with normal qualifying. Thereafter riders start on the grid in the finishing order of the previous race. 2017 Bucket One Hour Enduro. This year’s one hour enduro event was run in cold (5 degs.) and wet conditions. Quite a contrast to the previous day’s championship round which was a mild winter’s day with clear sky and sunshine. Because of poor visibility and slippery conditions the Le Mans start was abandoned for a normal grid start for safety reasons. A sensible move by the track officials. As well the race was shortened to 45 minutes owing to delays in the previous events. However when the race got going there was some excellent racing in all the classes. 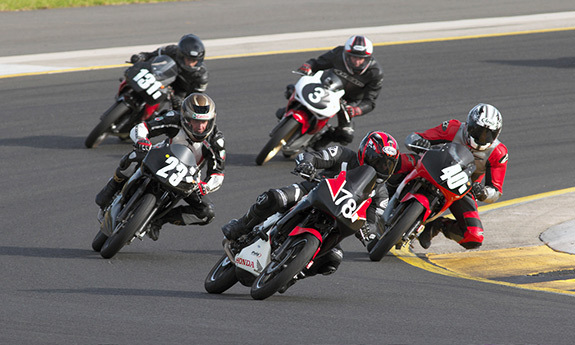 Father and son team Ken and Keo Watson on a Honda CBR125 were outright winners taking out the Commuterlite class win as well. This is the first time a Commuterlite has won outright. The #60 Gregory Oates/Tom Harrison team were the 2nd Commuterlite home followed by father and son team #41 Max and Chris Young (Yamaha YZFR125). #78 Peter Lindsay/Mark O'Toole (Honda CBR125) came home next. The Motolite class was won by Blair Briggs and the evergreen Michael Child riding Michael's Supermono197. They finished 2nd overall. After leading early in the race the #82 Robert Tisdell / Stuart Ellis Aprilia 150RS duo finished 2nd in the class and 3rd overall. Another Father and son team #38 Jim and Junior Murphy (BBE Honda CB185) won the Superlite class after Junior had a almighty tussle with #65 Tim Smith (Honda CB185) for the win getting it by .074 of a second the closest finish in One hour history. The #8 team of Kurt Wagus/Ian Gregory (Sky Ace 185) struck trouble when in the lead. The resulting lengthy pit stop cost them several laps but they still came in third. The 2017 One Hour will be remembered for the diabolical weather conditions and some great racing. ROUND 5 AND FINAL ROUND OF BRA/PCRA BUCKET RACING CHAMPIONSHIP. The final round of the 2017 Bucket Racing Championship was run on the GP circuit at Sydney Motorsport Park on Sat. 23rd on a 34 degree? Winters day. After some close and exciting racing the 2017 Champions had to race hard for their titles. Congratulations to all the winners and competitors who made it a great season of competitive and exciting racing. Also many thanks to the Flaggies and officials for putting up with the extremes of weather we experienced this year. Mostly volunteers our racing wouldn’t happen without this group of dedicated enthusiasts. Round four of the BRA PCRA championship was run at the ever popular Wakefield Park circuit on a pleasant winters day. Racing was close and exciting in all classes with many podiums decided by hundreds of seconds. Motolites: #68 Shane Wilcox Honda RS85cr won all three races to score maximum points and hoist himself into 2nd place in the Motolite Championship. Airing the promising Aprilia 150RS for the first time #81 Robert Tisdell was runner up. #94 John Olip kept the venerable Moriwaki 85 in the hunt placing third and going up to third in the championship. Number170 Michael Child Supermono197 finished fourth, a DNF in race one didn’t help. Superlites Pro: #38 Junior Murphy won all three races but was pushed all the way by #169 Ian Gregory. Third place went to #8 Kurt Wagus (SkyAce180). #65 Tim Smith (Honda CB180) had a day to forget finishing fourth and losing the championship lead to Junior albeit only three points behind. #2 Ken Lindsay finished fifth with #62 Jim Murphy and #56 Hermann Wagus coming in next. Only 24 points difference spans fourth to first in the points table so an exciting finish coming up in the Superlite Pro Championship final round. Commuterlite Pro again saw #39 Ken and #43 Keo Watson circulating in close formation with Keo taking the win narrowing the gap to Kens diminishing Championship lead now down to 5 points. Keo will have to win 2 races and not finish lower than 3rd in one race to win the Commuterlite championship. #3 Peter Lindsay came in 3rd consolidating his third place in the Pro Championship. #4 Martin Kraymaat finished 4th. with #60 Gregory Oates 5th. Commuterllite AM Class Newcomer #9 Brent Barassi won overall with two wins and a sixth. #194 Bradley Burt competing in only his second meeting this Year finished second. Third place went to #21 Craig Stewart. Round three winner #31 Christopher Dobie finished fourth. Championship contender #78 Mark O’Toole finished 5th to close the gap to the leader to 21 points and just 1 point behind 2nd placed #66 Andy Lewer. Championship leader #49 Gregory Burt finished sixth overall. Finishing order for rest of field, 7th #66 Andy Lewer, 8th #73 Daniel Florence, 9th #54 Raymond Wright, 10th #41 Max Young, 11th #37 Luke Young, 12th #53 David Hagney, 13th #22 Tom Harvey, 14th #24 Tom Harrison. Superlite AM: #57 Stuart Ellis 2016 AM Champion doing a one off meeting pedalled his smart looking Suzuki GS150 to win his three races with #120 Nathan Taylor (Suzuki GS150)finishing second. Championship leader #666 Shaun Bray (Suzuki GS150) didn’t add to his points score. Round three of the BRA PCRA championship was run on the North circuit at Sydney Motorsport Park on a cool winters day. In Motolites #60 Jason Dunn Honda RS85cr continued on his winning ways looking like he's heading for a record breaking fifth Motolite title. Number83 Edward Marsden finished 2nd to move into 2nd in the Championship. Number170 Michael Child Supermono85cr finished 3rd and displaced #94 John Olip (DNF'd race 2) for 3rd in the Championship. Superlites Pro put on a some great battles in the 3 races with Championship leader #65 Tim Smith (Honda CB180) coming out on top taking the win and increasing his lead in the championship. Second place went to #8 Kurt Wagus (SkyAce180). Kurt is fourth in the Championship. Third went to #38 Junior Murphy (Honda CB180) who is third in the Championship. Number 169 Ian Gregory retained second in the Championship by finishing fourth keeping his Championship hopes alive. Commuterlite Pro again saw #39 Ken and #43 Keo Watson circulating in close formation with Keo taking the win narrowing the gap to Kens diminishing Championship lead. #3 Peter Lindsay came in 3rd consolidating his third place in the Pro Championship. Commuterlite AM class Newcomer #31 Christopher Dobie won overall with two wins and a fourth ahead of new championship leader #49 Gregory Burt who finished second overall. #66 Andy Lewer came in third to move up to second in the AM championship. Former championship leader Mark O'Toole suffered two DNF's but recovered to win race three to keep himself in the championship hunt. Other newcomers #53 David Hagney and #128 Scoobie Breen acquitted themselves well finishing fourth and fifth. 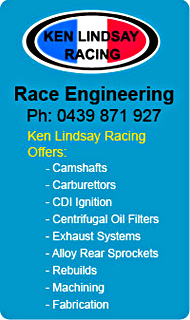 Next meeting round four will be on at Wakefield Park on Sat. 26th. August with the Bucket One Hour enduro on the next day. Blair Briggs #23. 12th June 2015. When offered the opportunity to ride a Commuterlite Honda at the 2nd PCRA round I was pretty excited, I've watched many of the races and have been enthralled by the close competition. My PCRA years have been spent on a Laverda 1000 triple, an exotic Italian classic owned by Crispen Trueman. The Laverda is a big bike she weighs a fair bit and puts out around 100hp so my track knowledge is based around this bike. Enter May 30th and my Commuterlite debut! Just before I went out on the track I made some enquiries and discovered the CBR Honda had 6 gears, so many choices, I followed everyone around trying to figure things out when our session was declared I only completed one full lap! Would sort things out best I could during the first race. I customarily get good starts and did on this occasion as well, loved the hustle and bustle of turn one but kept myself clear of (causing) trouble, turn two was bit of a laugh I had no previous braking experience except from the Laverda so was miles out and lost most of my gains from the start. Great drive out of T2 and pegged a couple back only to repeat the same mistake at T4 (had seized a 250 Suzuki there about 30 minutes before!) Again good drive had me back in the fray but really that was the pattern of my race. I was learning quickly from the other riders and was really impressed at their commitment and race craft. I am looking forward to the next round on the 13th I hope to be able to complete the season on the Honda. I'm learning so much being on this type of bike it reminds me of my 250 production days in the late 1970's although I must admit I'm a bit more risk averse these days. The commuter lite class has a real sense of community with riders dropping by to see how its going and see how I'm enjoying it, well I'm hooked its that simple. Typical of the dicing in Bucket racing, always close and a lot of fun. Here #78 Mark OToole (Honda CBR125) leads #23 Blair Briggs (Honda CBR125), #40 Richard Cook (Honda CBR125), #131 Rez Pulido (Honda CBR125) and #3 Peter Lindsay (Honda CBR125). Racing is always close with positions changing corner to corner.